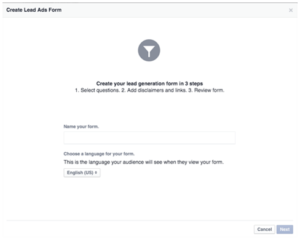 Guide to Facebook Lead Form Adverts! Home » Guide to Facebook Lead Form Adverts! 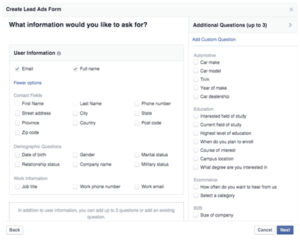 Facebook rolled out ‘Lead ads’ to overcome people’s apprehension to fill out long forms. You may also call it as the ultimate lead generation ad format. Clicking the call to action on a standard News Feed ad, launches a native lead form on Facebook. The form even pre-fills fields like Name, Email in an editable form to save time. To put it simply, Lead ads allow marketers/advertisers to collect information from prospects directly from ads instead of sending the traffic to a landing page wherein people have to manually fill in a form and press submit. 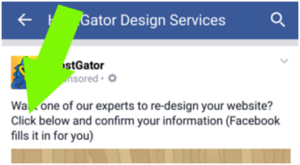 Here, people click on the ad, with a pre-populated information (name & email) list, all they have to do is hit submit, all within the Facebook platform. With just a click, the conversion rates are huge and the cost per lead is much lower than sending them to a landing page. 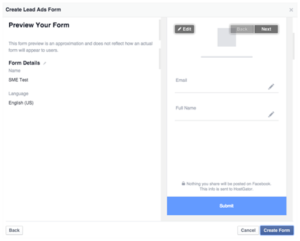 Facebook will auto fill the form with the user’s existing profile info, so there is no long lead form to fill out. At the bottom, there is a link to company as well as Facebook privacy policies. This alleviates the sense of risk some people have about sharing their contact info. This welcome screen serves as a type of landing page that detail out your offers and entices action. In marketing, a lead generation is the generation of any consumer interest or inquiry of any products/ services of a business. Building a list of qualified leads is a priceless asset for any company/ business, its cost efficient and works great for brand awareness. This clearly shows that through lead generation, one can easily reduce the cost to acquire a customer by 50%, while increasing the revenue generated by each customer! 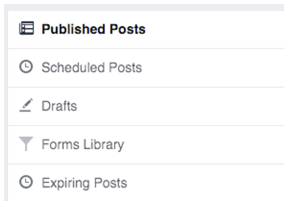 Facebook has an advanced form editor that covers a range of form options. There are a number of standard questions that fit perfectly for various industries. Each of these questions can have either a free text field or a preset list of options in a dropdown select. It’s preferable to keep the questions to a minimum to maximize your form conversion rates. For example, simple email-only forms come in at < $0.50 per lead as compared to long forms which come at $5+. 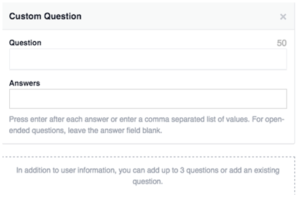 It informs users what they need to do and explains them clearly that the process is easy because Facebook will fill out the form for them. 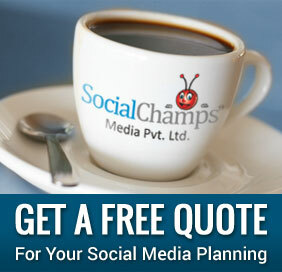 Helps in increasing your conversion rates by making the process clear to users. Try Capturing Leads at Night: Though many Facebook advertisers would suggest running your ads throughout the day but there are situations when the day-parting feature is useful. But when it comes to leads, it’s beneficial to capture them during the evening since majority of people are comfortable in giving out their information freely in the later hours. Try to test this for yourself. 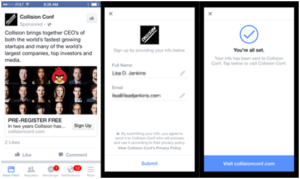 Test your ‘Call to Action’: Right now, Facebook has only a few calls to action such as: Subscribe, Download, Get Quote, Learn More, Sign Up and Apply now. Select the one that reflects what you are trying to accomplish and test how it works. After submission, your lead clicks “Visit website” tab. Landing page of the website should give them the link to download the guide. Quickly send a copy to their email inbox. Speedy responses: Responding to leads quickly increases the chances of a conversion. For example, If your tab says “Click here to download our Content Marketing eBook”, after the user clicks on the tab, it should instantly send an email with the PDF to download. Add context: Add some context within the ad unit so that there are no surprises when the user click on it and it launches a form. For example: “Click here to book now”. Treat your ad like a landing page: Tell about your USP and why one should share their details with you. Remember you have only got your ad copy and image to get your value proposition across before they launch the form. Optimize to keep your CTR high: If your ad is overly ‘form-like’, and your CTR (click through rate) drops below 1%, it doesn’t take long for delivery to drop. Make sure to optimize and try new creative regularly to keep the CTR of your ad high. Value verses data: Giving personal info is no different than buying a product itself. Make sure you’re offering compelling, valuable rewards such as free PDFs, coupons etc for completing the form. 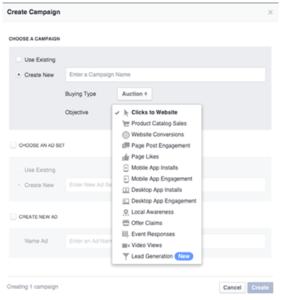 Download your ads account to Power Editor andclick the ‘Create Campaign’ button. Then type in a name for your ad and click the objective drop-down menu. If you have access to the Lead Generation objective, you’ll see menu options as follows: Select Lead Generation as the ad objective and then continue the ad creation process as normal. When you get down to the ad level, you’ll see the lead form section as: Click ‘Create New Form’ to create your first lead generation form. Select the details that you want to collect from your potential customers and prospects. You may also add custom questions or any other information that you wish to ask from your users. Once you are through adding your questions, click Next. Lastly, enter your website address. Customers will have an option to click through it after they submit the form. Click Next. Review your form and if everything looks fine, click Create Form. Accessing your leads is a manual process as of now. There is no option to import your leads automatically to a mail tool right now. To get your leads, Go to the Facebook page connected to your ads and click the ‘Publishing Tools’ tabat the top. Then click ‘Forms Library’option on the left side of the screen. You need to have admin access to view forms in the forms library. After clicking, you will see all the forms that you created on the right. Click the ‘download link’ next to your form to download your leads in CSV format. The column fields in the file are pretty self-explanatory. Columns A- F gives you details about your ad, campaign, when the lead was captured and the information you requested from the users. You may upload this data to your client management tool or share it with your sales teamto contact the leads. 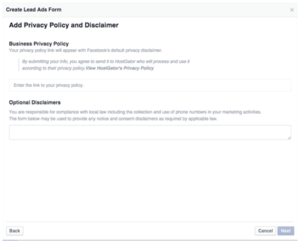 And lastly, before you get started, remember to accept Facebook’s Lead Ads Terms of Service for each Facebook Page. You won’t be able to publish your ads if you don’t accept these terms. Also, you are not permitted to share/ sell the data you gather from Lead Ads. Lead Ads are undoubtedly, an exciting new addition to the advertising tools offered by Facebook to the advertisers and marketers. Designed to increase the success of lead generation campaigns and to take away the necessity of creating landing pages for different campaigns, this tool will not only help you gain new customers but will also increase your conversion rates. It’s pretty easy to see why so many marketers/advertisers are eagerly jumping on using it. 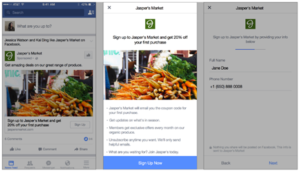 What is your opinion on Facebook’s new Lead Ads? Have you tried them yet or are you planning to do so? Share your thoughts, knowledge and experience with us! For more details visit services. Nice article! Facebook Lead Ads are really a great tool to capture leads and increase profits of companies. The problem with Facebook Lead Ads, as you mentioned, is that you can only store the leads in a CSV file that Facebook lets you download then: to run a campaign this way, you need to export and import leads all day long, every day. This takes up too much of your time! For those who want to import contacts instantly in their CRM tool / Autoresponder, the only way is to use a third-party software such as LeadsBridge, that allows you to instantly send your offer to your subscribers. I’m part of the LeadsBridge team and I hope this was helpful! Leadsbridge looks an interesting tool.